The already-scrumptious super-sedan looks super-hot on 21-inch ADV.1’s. 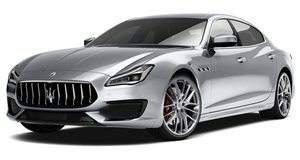 The stunning Maserati Quattroporte GTS doesn’t need much help with turning heads and striking a chord with any enthusiast. The 3.8-liter 530 horsepower V-8 gives the breathtaking sedan accelerating power like no other, with a top speed of 191 mph and a 0-62 mph time of just 4.7 seconds. Mated with its beautiful design inspired by Maserati’s finest sports cars, this is a four-door beast on any set of wheels. But taking the car’s looks one step forward, Maserati of Fort Lauderdale has fitted this silver Quattroporte with 21-inch ADV.1 wheels. Finished in matte black, the ADV08MV2 wheels look absolutely stunning on this Italian beauty. Check out the awesome pics of the addition and look who the Maserati gets to share its garage space with!